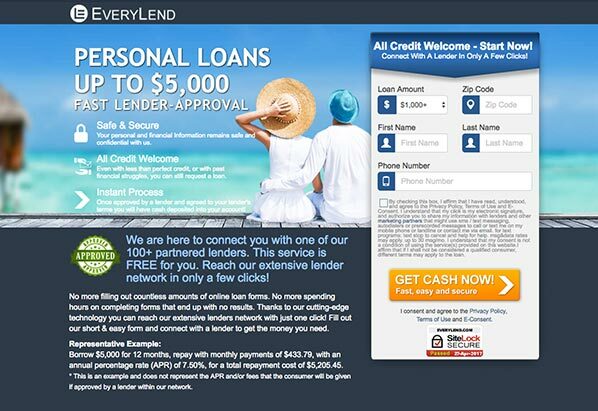 EveryLend offers customers access to its extensive network of reliable loan providers. The company, which helps match borrowers to lenders, works to help ordinary people avoid the red tape and bureaucracy of accessing a traditional bank loan. Instead, EveryLend’s partners, the lenders, are focused on offering quick financing solutions with reasonable rates and shorter loan terms. Thanks to a straightforward application, EveryLend can help any customer find the funding they need for a life project or to cover an unexpected shortfall. Thanks to a speedy process and relatively low barriers to qualification, EveryLend is an excellent alternative for those borrowers seeking an easy and fast solution to access funds for necessary life projects, emergencies, or major expenses. EveryLend's wide network of lending partners helps borrowers gain the leverage of being able to get funded even if a specific lender does not approve them. Even better, the company’s network of lenders offers highly competitive rates and an impressive range of repayment terms. Overall, EveryLend represents an ideal service for those borrowers who require quick funds and are looking to avoid the bureaucracy of institutional lenders. The application process proved quick and painless with EveryLend. 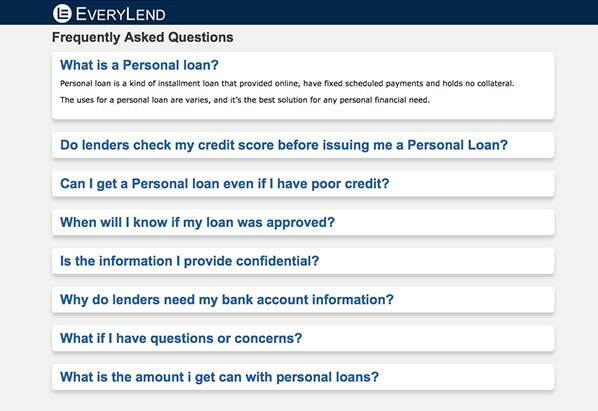 To get started, EveryLend asks prospective borrowers to fill out a simple form on their website. This includes basic information regarding the desired loan amount and preferred term length, as well as some personal details and financial records. Once completed, customers will be matched to a lender within EveryLend’s network. From there, customers will negotiate the final terms and rates directly with their matched loan provider. Overall, we found the process was straightforward and did not present any barriers to accessing the funds required. Though the company’s website might present a simple service, we found EveryLend’s solution to be quite comprehensive and powerful. We were impressed with the company’s quick application process, and how easily it can match potential borrowers to the lenders that can approve them. Overall, the process takes as little as five minutes before delivering customers an excellent selection of loan options. This is a terrific way to empower borrowers, as it forces lenders to compete against each other for their business while leading to more favorable terms for consumers. Additionally, we were very appreciative of the company’s website design. The site features a straightforward and intuitive design, hosting all the necessary information in one page and guiding customers through a very easy and detailed series of questions. Even better, after completing the application, if you could not be matched with a lender, EveryLend can help you find alternative options to get funded. 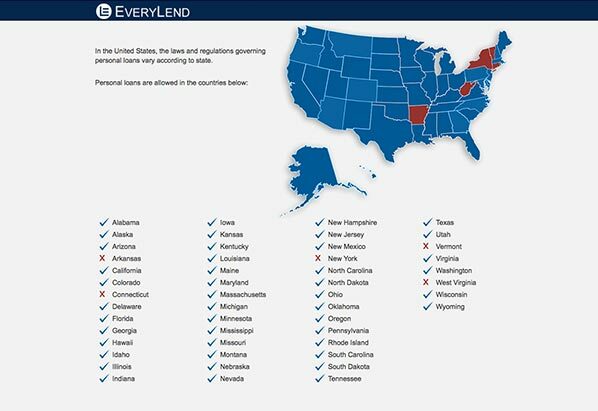 One of the best aspects of EveryLend is that the company is willing to work with customers of all credit backgrounds. EveryLend does not have a minimum credit score requirement, and is happy to help borrowers with all levels of credit access the funds they need within a short period of time. Moreover, the company’s loan providers feature competitive interest rates—between 6.00% and 35.99%--and a great selection of loan amounts ranging from $500 to $5,000. With a turnaround of as little as one business day after approval, certain partners within EveryLend’s network can offer an expedient solution for those borrowers seeking emergency funds or extra financing to cover a major expense. During our review, we found that EveryLend was very successful when it came to matching us to a loan provider. Besides giving us more than a few alternatives every time we completed the application process, it was nice to see that EveryLend’s service is completely free of charge for consumers. The company does not collect any fees at any point during the application process, even when matching borrowers to a lender. One feature that was particularly beneficial for shorter-term borrowers was the range of loan terms and rates offered by EveryLend’s network of partners. While the company does not directly guarantee any terms, as it is not a loan provider, it does list highly competitive representative rates on its website. EveryLend’s partners offer loans that can be repaid in as little as 85 days, and as much as 30 months. We found that this is an excellent range for the loan amounts offered, and they balance quite well with the quoted APR rates. It is important to keep in mind that official terms and rates for any loan found through EveryLend’s service are negotiated and agreed upon with a customer’s matched lender, and EveryLend does not directly influence these discussions. Overall, we found that EveryLend does a good job of protecting its customers’ personal information. The company is very transparent about the information it collects from customers during their visits to their website, as well as how it uses that data. EveryLend employs industry-standard security measures, both electronic and physical, to protect its customers’ personal details on their servers. To reach EveryLend, customers can fill out a ticket on the company’s website and will receive a response via email or phone. Overall, we found that the company’s service representatives were well-versed in their field, and answered our queries courteously and efficiently. Via email, responses were received very quickly, and the information was both accurate and professional. We would have liked to see another channel of communication, such as a telephone or a live chat feature, but found that the available support was more than capable of handling most of our questions and concerns. The company could offer more information in its FAQ section regarding its practices. We would have liked to see more channels of communication available for customer support. Overall, the website could have more information regarding the lending and matching processes. Their partners offer excellent loan rates and repayment terms. Support staff representatives are qualified and courteous when reached. EveryLend’s matching process is quick and painless. The company counts on a massive network of qualified and reliable loan providers. All told, there are several notable aspects of EveryLend’s personal loan service. Though not directly a lender, EveryLend works with a wide network of trusted and qualified loan providers that can accommodate customers with all kinds of specific needs and credit qualifications. The company is willing to work with customers of all backgrounds, and a simple process can help match potential borrowers to a lender that is willing to work with them to find the funds needed. We were happy to see that EveryLend is very transparent about its process and the terms offered by its partners, as well as being deeply committed to customer privacy and data security. Overall, this choice represents a great option for customers who need a quick source of financing and prefer not to go through institutional or private lenders.